Given the rising costs of new professional hardware these days, a lot of professional photographers are questioning the need to upgrade their cameras on a regular basis. I am among them. It’s not easy to pass on the opportunity to buy a shiny new camera, so there is a question I always ask myself before I embark on any upgrade and that question is this; what will it add? What do I get that I didn’t get before and if there is something to get, is that thing absolutely necessary in my case? In my current situation I am shooting with 2 Olympus E-M1 bodies. I’ve had them since 2014 so they have done a fair amount of service for me and apart from an issue with the rear command dial not always making proper contact on one of them, they have been pretty solid performers. I don’t shoot anything that requires super fast auto focus tracking, nor do I need resolution higher than what I have at 16MP. In fact, most of the work I shoot is downsized for use on the web so I could probably get away with a 3MP camera that offers 2000x1500px images (just as long as the 4 and 5K market for monitors remains bearish). A new 20MP MFT sensor wouldn’t really be adding anything when 16MP is currently more than I need. So when the Olympus E-M1 Mk II came out last year I asked myself that question; what does it add? I mean, I wanted a new camera (who doesn’t), but the launch price point of $2000 caused me to pause for a minute. In my case to replace my two bodies for 2 new ones would have required more than $4000 outlay in my country. I have become used to using two bodies set up exactly the same way for events so that I don’t even have to think about my settings, I just know the cameras. To begin using bodies that are slightly different might cause me to falter a little at a time that might be critical while shooting. So, no. That’s not an ideal situation for me. If I was going to upgrade it would have to be to two new bodies at the same time. Then there was the question of batteries. With the E-M1 Mk II came a new battery. I currently have 7 of the old ones for the original E-M1 cameras and while I have never gone through more than 2 per body on any shoot I have done in the past 4.5 years, I wouldn’t like to chance it, so a couple of extras would definitely be needed. Those batteries are not cheap. I would also want battery grips for both cameras like I have on both the Mk II’s when I am doing events, so more expense there. All this expense for better auto-focus and a little more pixels simply didn’t make sense in my situation, so the idea of upgrading my camera bodies came to a grinding halt when it was obvious that there was no real addition going to happen. It’s the same question, really. If a new lens comes out that radically adds to my ability then I have to look into that lens. For example, the new Panasonic 8-18mm f/2.8-4.0 really does have me asking this question a lot. I already have the Olympus 9-18mm f/4-5.6 which only does real estate photography for me, and this I always do at f/8.0. It’s an OK lens, but asking the question, if I replaced it with the Panasonic, what will it add to what I do? There’s only 1mm of zoom advantage in the Panasonic and a stop of light that I don’t need, but… there is also better optical performance. That might be the addition that sways the upgrade decision if it saves me time and improves my output in areas that will be significantly noticeable. For instance, how will it handle flare from windows? Is the lack of distortion and improvement in sharpness something that will bring me more RE work and possibly lead to the more lucrative hospitality market? These are real areas that I look into when making decisions on upgrading lenses that are currently working for me. The 8-18mm is probably going to be something I do get. Another example on the lens front evaluation is one related to my long lens needs. As regular readers know, I have been a huge fan of the older Olympus 50-200mm f/2.8-3.5 SWD that I have used on more than a few safaris these past 4 years, so when the newer Olympus 40-150mm f/2.8 PRO lens came out a few years ago I was at great pains in making the decision on whether to get it to replace my older, but still very capable workhorse. So I asked myself the question; what does it add? The answer I came back with was, nothing but aesthetics, maybe faster AF and shorter close focusing. However, it has less focal range, doesn’t have quite as nice bokeh and to be honest I wasn’t totally blown away by it when I used it at my niece’s wedding. The 1.4x teleconverter that was built for it didn’t impress me much at all either. The quality of the 1.4x TC for the 50-200mm is so much better that it’s not even a debate. So, unless my old lens packs up, I probably won’t get the new one. It was pretty obvious that if I was going to buy the 40-150/2.8 PRO I would be doing it to satisfy something other than a real need. We all know what that something is. It’s GAS. When I look at my current gear setup, there aren’t many holes that need filling. I can pretty much do everything needed of me as a professional photographer, so the likelihood of upgrades happening in the near future are as likely as me running for public office. I hear what you say Dallas, but luckily I don’t have to make a living from my camera!, but I do have to own up to being a gear tart and find it very difficult to resist a new shiny toy! Just take a look at my gear list! 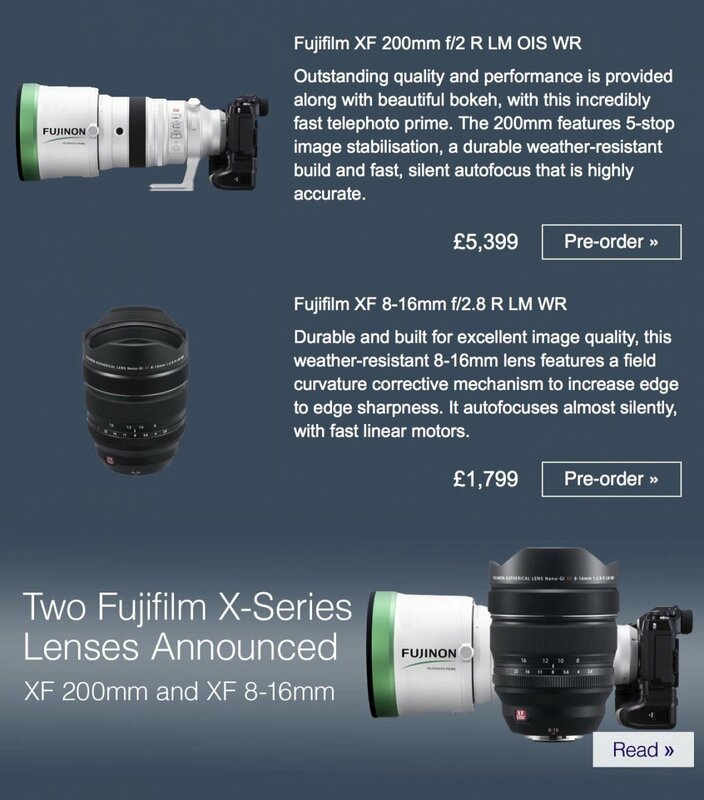 Just received an email from WEX UK advertising the two newly announced lenses! For me a disincentive to buy! I do miss being able to call photography my hobby. It’s all business these days. Sound advice Dallas but far too late for me! I've suffered GAS all my life and have groaning shelves and an empty bank account as proof. I feel the 2/200 looks attractive to me, even I do not own the Fuji system. Another hit into my stomach. I really want to have the Nikkor 2/200! My method for justifying new gear is that I try to estimate how many really good pictures I can get with this new gear that I can't get with what I have. I then divide the cost of the new item by the number of good photos and look at the result. If I am honest about the number of good pictures, the resulting answer can be very sobering. This method made me rethink getting the Panasonic 100-400 mm lens to replace my 75 -300 mm Olympus., although I still sometimes weaken and buy a new item anyway. However, I did get the Olympus 12-100 mm F4, and it has justified its cost , as it can usually be the only lens I need to carry for some photo shots. It is an excellent lens and the stabilization combined with my M1 Mk II have resulted in many photos I could not have gotten otherwise. That's a good way of doing it. I had that Olympus 75-300mm but never liked it. I think the Panasonic 100-400mm is in a different league though, so it is certainly a lens I would like to try. Whether or not I could justify the purchase is another matter entirely! The 12-100/4 has been highly praised by many, so I am steering well clear of it! The 12-40/2.8 is still my most used lens for general purpose stuff. I do think I would miss the extra stop of light in an event shooting scenario, so I'm using that as my method of avoiding the upgrade question in this instance. Nice to see you again, Frank. The grenade launcher Nikkor is certainly an amazing optical beast, but I think it's size makes it somewhat impractical to use for most handheld type work. For indoor sports it must be amazing. 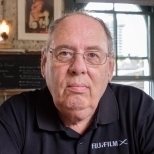 It'll take a much updated and/or changed sensor to get me to buy another Fuji camera model - the X-H1 didn't entice me as most of its new features are ones I'd get little or no use of, while the sensor and processor remained the same as the X-T2. Equally the 8-16 and 200 f2 are appealing, but I'd probably hardly ever use them. At present the 10-24 OIS zoom fulfils my needs and the 8mm f2.8 Samyang fisheye gives an unparalleled ultra-wide view when straightened up with Fisheye Hemi software. The sheer expense of that zoom is off-putting enough for me, and while it will probably find eager buyers amongst event photographers as the missing f2.8 zoom in the "pro" zoom trio, I'm done with that sort of photography now. The same applies to the 200/2 - for the rare occasions something like that is called for, I have a perfectly excellent manual everything P6 Jupiter 3,5/250, which will probably give an image appearance when adapted to the X-T2 that's similar to the new Fuji lens, only it cost me just $97 (plus postage). Being of Zeiss Sonnar design there's zero to complain about in sharpness, even if the contrast would be noticeably down compared to the Fuji lens and in far greater need of being mounted on a tripod in use. For portraiture that's not going to be a problem, and neither is its size - gathering from its appearance in the photograph, the Fuji lens also looks to be quite a boat anchor. Failing the dramatically new sensor in the X-T3 or X-H2, I'm guessing then that the X-T2 will end up being the digital version of my old Nikon F4, which was my sole 35mm work camera for 13 years (1993-2006).